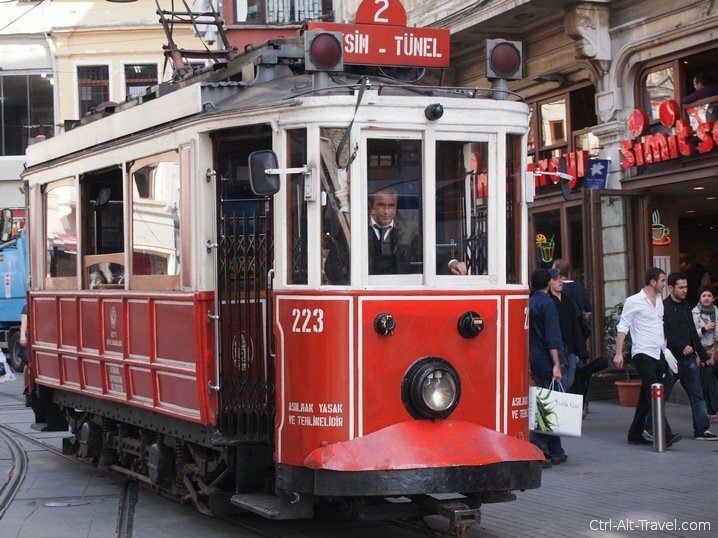 Many of the sights of Istanbul soar upwards. The mosques and their minarets reach toward the sky all over the historic city. 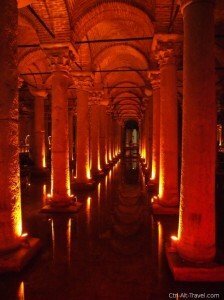 The Basilica Cistern though reaches down. It is buried underneath a hill up the road from the Hagia Sophia museum. It is so central, that despite being just a tiny bit cheesy, is well worth a visit. This is especially true on a hot day as it is cool down below. It is pretty dark, so pictures are difficult, but memories are always better lit. A cistern in general is a place that stores water, usually collected rainwater, for later use. So this place is actually pretty practical in nature and yet is quite beautifully constructed. 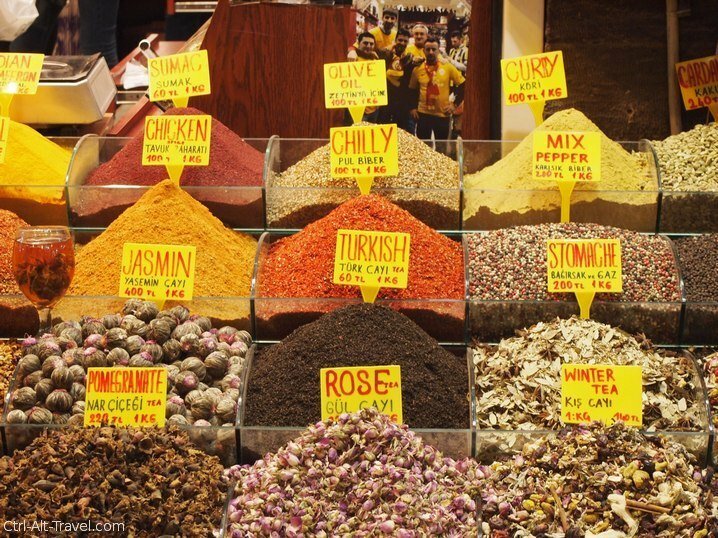 When Ali and I were in Istanbul for our honeymoon, it was on my list of things to see. The visit doesn’t take long to get a feel for it. Depending on the line you may wait longer than you are down, but still worth the wait. It is call “Yerebatan” for Sunken in Turkish and signs point to it around the square near the tourist office in the Sultanahmet area of old Istanbul. Just look for the long line that seems to disappear into a low unassuming building. Pay your TL10 and head down the stairs into the cool chamber. 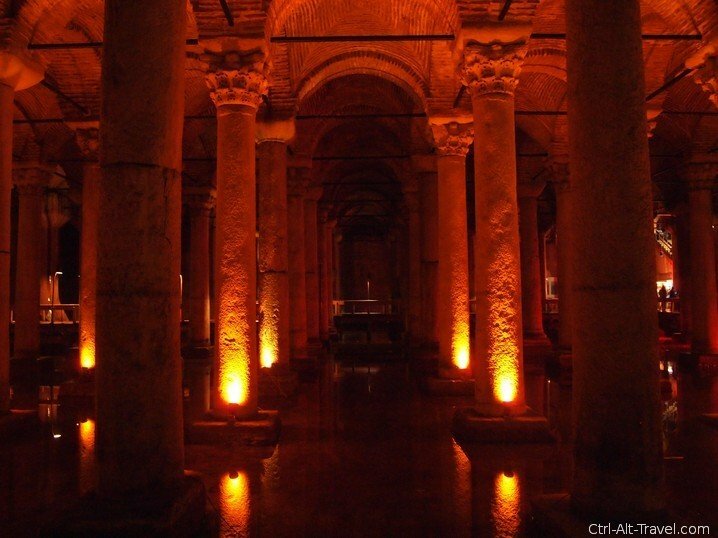 The Cistern is ancient, so it should feel more historic, but it ends up feeling a bit cheesy in places. There was a corner offering to let you dress up and pose for a picture in front of some scene. I expect that at a theme park, not a centuries old hole in the ground. In another area there was a plastic “sea monster” in the water with a sign talking about it being a hypothetical thing and to go to some other museum to see more. The day we were there it was full of students so the echoes of children added to the field trip feel of things. 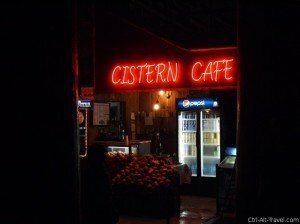 At the end of the walkway you follow through the cistern is a cafe with a neon sign and a group of tables. 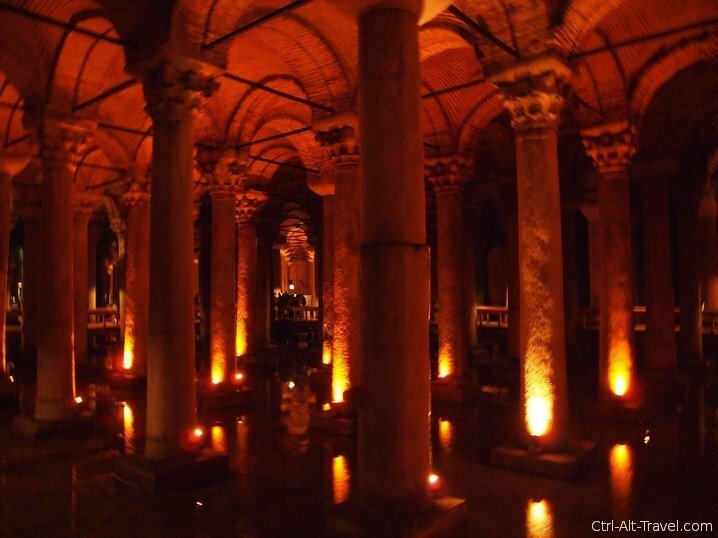 Since it was so cool in the cistern, I can imagine it might be a nice place to sit in the heat of the summer, but it does make the site feel more touristic than it needs to. Despite all of the things that might detract from it, the cistern is really a neat place to walk around. 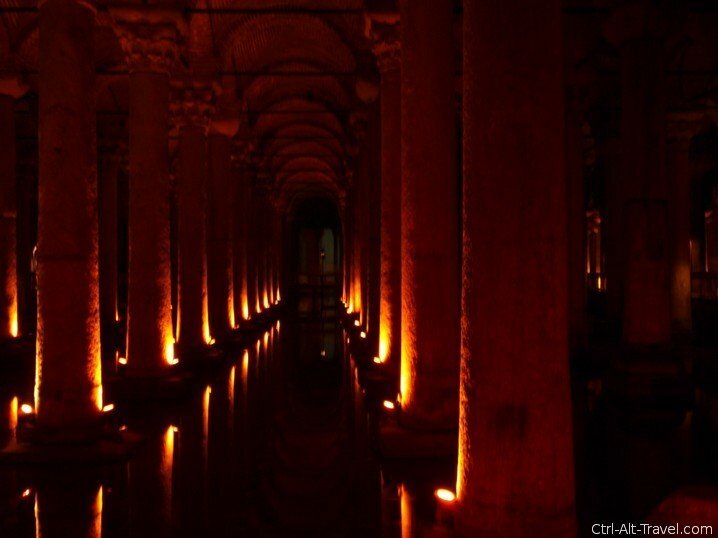 To imagine the centuries it served water to palaces and other centuries laying undiscovered. The lights are dim, making pictures difficult, but a steady hand and a “night time” or like on my camera “candlelight” scene setting and they are definitely possible. As for sights within the cistern, check out the fish in the first pool. They swim around in the red lights and above a number of thrown coins. (Seriously people, not every pool of water grants wishes. A cistern is not that same as a wishing well.) The roof is held up by tons of columns, which are pretty ornate for something so practical. Down at the far corner from the entrance is an area where they have pumped water away from the base of a few columns. You can walk down and look at a pair of medusa statue heads that have been used on their sides as bases of the columns. Natalie has some better pictures of the medusa head than I got (crowds and awful flashes prevented me) and some cool references to Mark Twain about the place. I mostly just enjoyed wandering around talking pictures of the patterns that the columns made. Ok, it is a touristy site. This is proven by the presence of a dress up photo corner and a horde of school children (“I don’t wanna go to the ancient historic stuff. We did that last year.”) but I enjoyed it nonetheless.